Premium Compatible Label Tapes for the Dymo Letratag LT 100T printer. 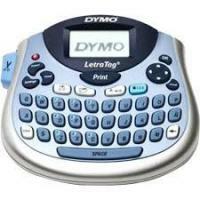 The Dymo Letratag LT 100T is a personal, compact handheld label maker that is able to deliver fabric labels. This model is ideal for home use as it can also deliver everyday labels to mark items in the kitchen, garden, and even in the office. The compact printer has a desktop-style design and it measures 6.7 x 2.8 x 5.7 inches. It is a lightweight machine as it weighs approximately 0.640 kg. So it can be easily portable from one place to another. It features a full QWERTY keyboard for easier typing. A large 13-character display is provided for easy viewing the text. On the side, it has a manual cutter lever and battery. There are cassette label compartments in the backside. The printer can also be powered by an AC adapter. The Dymo Letratag LT 100T labeling machine offers 5 font sizes, 7 print styles, and 8 box styles. Printing with Dymo Letratag LT 100T Label Tapes is very easy. It also supports underline and many customization options for labels. This model can also print up to 2 lines on a single label. This label printer can help save battery life as it has an automatic power shut off. The Dymo Letratag LT 100T label machine is a good choice for home users. It is user-friendly as it has a large navigation and function buttons. It can deliver fabric labels that can be ironed onto children’s clothing and other fabric types. It also features a standard print preview that shows texts and designs before printing on Dymo Letratag LT 100T Label Tapes. Due to this, print errors on the label can be reduced. Q. Why is it important to keep a check on your Label Maker? A. The label maker is designed to provide with long and trouble-free services while requiring very little maintenance. You must clean the label maker time to time to keep it working properly. Maintenance of the label printer is important in order to get clean and clear labels. So clean the cutter blade each time when you replace the label cassette and also clean the printheads for any clogged nozzles. For smooth printing, you must clean the printer time to time to get good prints. Q. Does Dymo Letratag LT 100T include tape with it? A. Yes, you will get the Dymo Letratag LT 100T Label Tape along with the label printer. Q. How the LCD display of the Dymo Letratag LT 100T works? A. You can enter up to 100 characters and spaces on a label, however, the display will only show a small portion of the characters. With the Dymo exclusive graphical display, any formatting will be instantly visible to you. Like if you type the letters in italics with rounded borders, it will be clearly displayed. Q. Why Stripes appear on my label? A. When stripes appear on your label it indicates that you have reached the end of using the Dymo Letratag LT 100T Label Tape. So you can replace the tape cassette with a new one. Q. How to type the letters in uppercase using Brother P-Touch? A. To type the letters keep the key toggle capitalization on or off. When CAPS mode is on, the CAPS mode indicator will be shown on the display and all the letters that you enter will be marked capitalized. By default, the setting is CAPS mode on. When CAPS mode is off, all the letters will appear in lower case. Q. What is the expected delivery time of the product, if I order Dymo Letratag LT 100T Label Tapes on this site? A. All the orders are delivered by Fastway Couriers within 1-2 business days and require a signature at the time of delivery. Approximately 90% of our orders will be received before 12 noon and are despatched on the same day. You can also call us on 048 30833221 to check the stock if an order is urgent. Q. Do you have preview option available while printing through Dymo Letratag LT 100T printer? Q. What are the disadvantages of using Dymo Letratag LT 100T? Q. What should I do if the Dymo Letratag LT 100T Label Tape does not cut well? A. If the Dymo Letratag LT 100T Label Tape does not cut cleanly, it might be possible that the cutter blade has become blunt after repetitive use. Replace the blade with new cutter unit. Q. Does this machine take the same tape as the one from LT-100H? A. Yes, you can use the same tape for the Dymo Letratag label printer with model no. LT-100T and LT-100H. Q. I ordered the wrong Label Tapes for my Dymo Letratag LT 100T and wish to return them. What is the policy for returning them? A. In case you have ordered the incorrect Label Tapes and you have to return them, then please contact us within 30 days of purchase. The non-faulty label tapes must be returned unused, in their original undamaged packaging and in a re-saleable condition. We'll exchange the tape with the Dymo Letratag LT 100T Label Tapes or will give you a refund by placing a credit on your account. All such returns are subject to a 10% of restocking charge.